High ankle sprain, also known as Syndesmosis Ankle Injury, is a common injury in sports such are soccer, football, basketball etc... due to constant pivoting and sudden change of direction involved throughout the game. Ankle Syndesmosis injuries are often referred to as "high ankle injury" due to ankle swelling and joint pain in the ligaments located directly above the ankle. 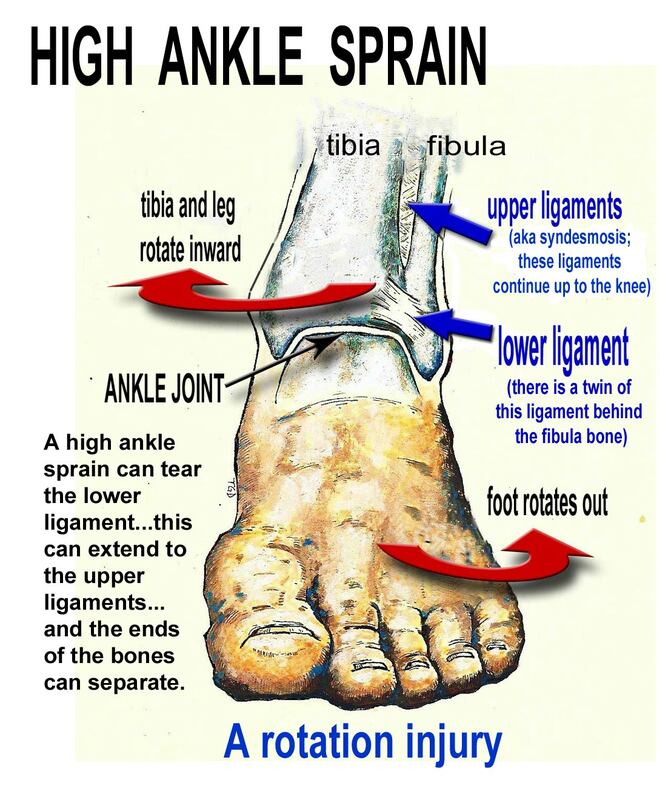 This is one of the reasons that this type of injury to the ankle is called high sprained ankle injury. Unlike the eversion and inversion ankle sprains, where ligaments are stretched or torn on the outside or inside of the ankle, high ankle injury will stretch or tear the ligaments above the ankle. Ligaments above the ankle connect the bottom ends of the tibia and fibula bones (lower leg bones). High sprain ankle injury is one of the more serious injuries of the ankle, and it will take twice as long to heal than a typical sprain of the ankle. Even a mild high ankle injury takes at least 4-6 weeks to heal, before an athlete can return to any activity that involves running. This is perhaps the most severe injury of the ankle, where even a minor sprain will cause pain in the foot and ankle, keeping an athlete away from training for several weeks. High sprained ankle may also feel like a typical ankle sprain, causing ankle swelling and pain on the outside of the ankle. Pain around the ankle can be felt when trying to run, change direction or jump on the injured foot; causing sharp pain in the ankle joint that may shoot up along the side of the lower leg. Ankle will feel weak, like it is giving out from under the athlete when trying to run or suddenly change direction. One common test for this type of ankle injury involves squeezing the ends of the tibia and fibula together. If there is sharp pain, that is one of the indicators that high ankle injury has occurred. Another test is to flex the toes up towards the head, while rotating the ankle. Sharp pain should be felt right above the ankle if the athlete suffered syndesmosis ankle injury, or high ankle sprain. When it comes to this type of injury, it is best to have a doctor diagnose the ankle injury, so that the full extent of the injury can be assessed through X-Ray, MRI or CT scan. It is crucial that this type of injury is diagnosed correctly, and not overlooked as a typical ankle sprain. Miss-diagnosing this type of injury can have long term effects on the ankle health in the future, bothering athletes for years to come. Treatment for this ankle injury will be the same as with typical ankle injuries, with only longer time period for recovery being different. RICE Method (Rest, Ice, Compress, Elevate) is one of the best treatment methods and should be applied as soon as the injury occurs. One test that athlete can do on their own to asses the health of the ankle, is to hop on the injured foot 15-20 times. If there is no pain in the injured area, it is good indication that the athlete can return to playing. However, if the pain and discomfort are still present during these hops, athlete should not go back to playing and instead should keep working on recovering from high ankle sprain. For more information about this type of injury visit FootCare MD.